[PRESSWIRE] Danang, Vietnam – 20 October, 2016 — Condé Nast Traveler announced the results of its 29th annual Readers’ Choice Awards and the iconic InterContinental Danang Sun Peninsula Resort made it to the list of the elite Asian resorts. Over a quarter of a million Condé Nast Traveler readers voted for their favourite hotels and resorts, cities, cruise ships and island destinations. The awards are the longest running, most prestigious recognition of excellence in the travel industry and are commonly known as ‘the best of the best of travel’. Speaking on the award win, Juan Losada, the resort’s General Manager said; “We are excited beyond description to be recognised as one of the top resorts in Asia by our discerning guests and readers of such a prestigious luxury travel publication. This is a testament to our commitment to excellence which our team has demonstrated every day in the past years. We look forward to delivering an even greater level of luxury experience to our guests who choose to stay with us”. Prior to this accolade, the InterContinental Danang Sun Peninsula Resort has been a recent proud recipient of “The Best Resort Hotel Asia Pacific” award by Business Traveller, “The World’s Leading Luxury Resort” award by The World Travel Awards and has made it among the 21 Most Beautiful Beachfront Hotels in the World, as published by CNN in September 2016. InterContinental Danang Sun Peninsula Resort is one-of-a-kind resort that redefines the definition of luxury. Set in 37 hectares of stepped gardens leading down to a private beach, each of 200 rooms and villas guarantees dramatic views of crystal clear waters of the Eastern Sea. Every inch of this luxury resort is the stunning creation of the star architect Bill Bensley and, as a result, is unique in design and concept. 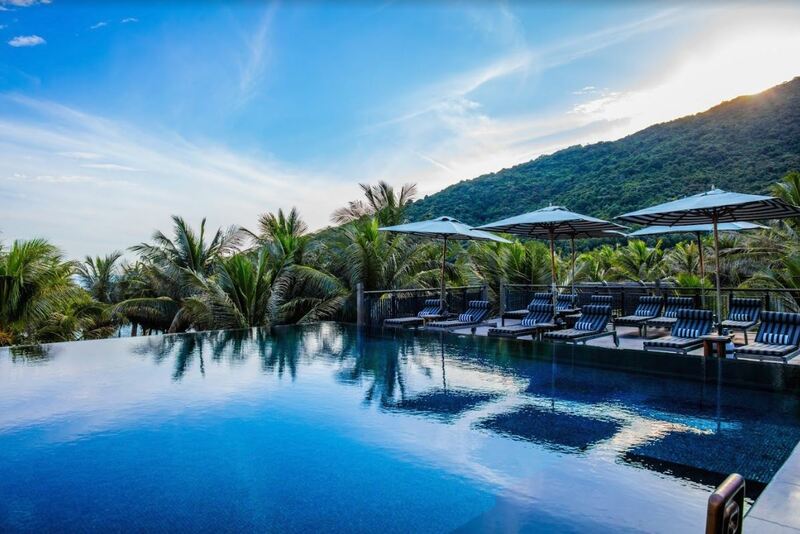 Hidden in the myth-filled hills of ‘Monkey Mountain’ in the heart of the Son Tra Peninsula nature reserve, the five-star InterContinental Danang Sun Peninsula Resort is a work of art as much as a resort. Set in 37 hectares of stepped gardens leading down to a private beach – dramatic views of the sea can be enjoyed from all 200 rooms – every inch of this luxury resort is the stunning creation of star architect Bill Bensley and, as a result, is unique in design and concept. Gourmet travellers will appreciate La Maison 1888 (and its outstanding wine cellar) by multi-Michelin starred Pierre Gagnaire, while those looking for a genuine wellness retreat will love the HARNN Heritage Spa set in a private lagoon. Travellers can treat tired feet to the ultimate pedicure by ‘podiatrist to the stars’ Bastien Gonzales as global leaders put the world to rights at The Summit, the resort’s impressive conference centre. Billed as the place “where myth meets luxury”, it’s an easy drive from InterContinental Danang to the UNESCO world heritage sites of Hoi An, Hue and My Son (described as “Vietnam’s Angkor Wat”) making it a perfect base for travellers seeking an experience that connects them to central Vietnam. The InterContinental® Hotels & Resorts brand has over 180 hotels located in more than 65 countries, with local insight that comes from over 70 years of experience. As a brand, we believe that superior, understated service and outstanding facilities are important, but what makes us truly different is the genuine interest we show in our guests. Our desire is to help guests make the most of their time. We connect our well-travelled guests to what’s special about a destination, by sharing our knowledge so they enjoy authentic local experiences that will enrich their lives and broaden their outlook.